Poached Eggs. How hard can it be ? 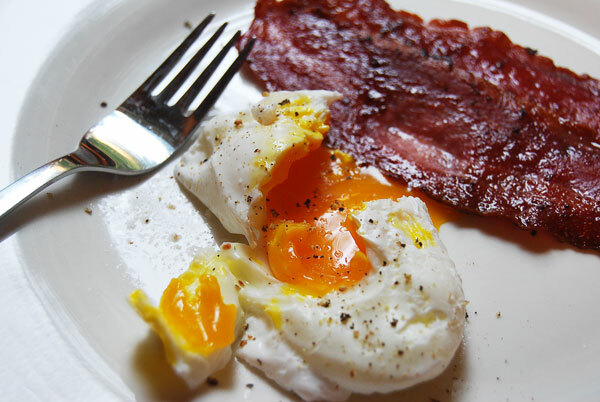 Well, if you are fussy about the perfect consistency of the yolk, it can be hard ! For me, I like it to be like a nice thick gravy – and since it’s been a while since I made poached eggs, it took me a couple of tries to get the time right. By the way, that yolk was not Photoshopped! We have chickens (I call them “my girls”), and I had been feeding them a little more corn than usual, which contributes to a fabulous orange colored yolk. Bring 1 cup of water up to boiling. Turn down the heat a touch so the water is just barely bubbling. Add vinegar. Crack an egg into a small bowl or cup. Gently slide it into the water. Cook for exactly 4 minutes! Sometimes I find after about 3 minutes that the top of the egg needs a little more cook time so I gently roll it over with a large spoon. While the egg is cooking, toss the turkey bacon into a non-stick pan and brown both sides. When the egg is done take it out of the water with a slotted spoon to a folded paper towel, roll it over to “dry” both sides.